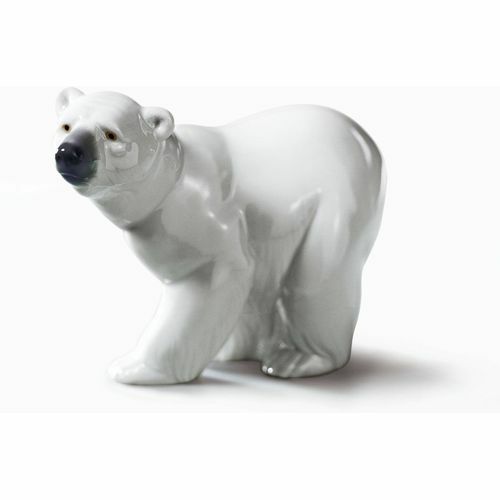 This adorable porcelain figure of a young polar bear standing attentively, sniffing at the cold arctic air, is ideal as a gift for christmas or as a keepsake for simply lovers of polar bears. The stunning sheet white finish of the fur accentuates the muscular power of the young king of the North pole and largest carnivore on the planet. Lladro Porcelain is produced by Artisans in Valencia in Spain. Lladro is made for memories, these beautiful classic and timeless creations make the perfect gift for all those special occasions throughout the years and make wonderful keepsakes for family & friends to treasure. Each piece is lovingly handmade and hand painted & comes with their unique Lladro markings by the Valencia Artisans. The Lladro Attentive Polar Bear comes presented in its Lladro presentation box & a certificate of authentication.